When you begin the long journey of planning your dream wedding, your mind fixates on the big things: dress, venue, catering, honeymoon. However, the smaller details that we don’t initially consider are also critical to get right. Wedding invitations are one such smaller detail that most couples tend to leave until the last minute – a move that we would describe as very unwise! Whilst you will be familiar with every intimate aspect of your big day, your guests will be almost completely in the dark until the ceremony itself, with only one clue as to the theme and style – the invites! 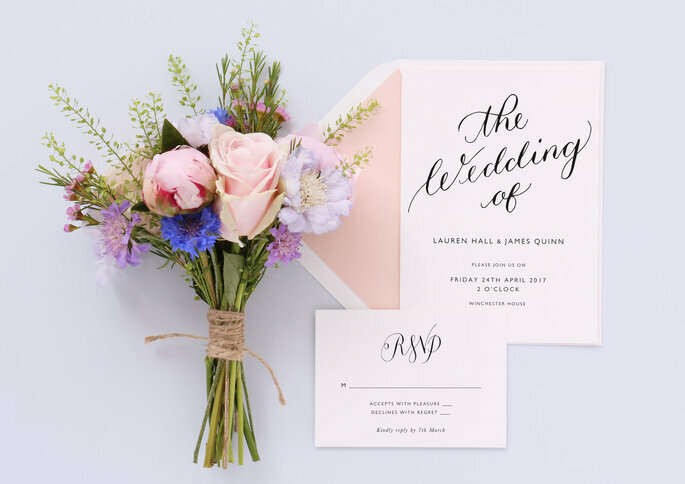 So make sure all of your guests get the best first impression of your wedding, and follow our top tips on how to choose and write the perfect invitations to get everyone excited for the big day! Unless you’re very committed to the element of surprise, then you should make sure that your invitations reflect the tone, style and theme of your big day. It can be difficult to know where to start with this, or how to achieve a level of comparability, so start with color, and work your way from there. We would definitely recommend that you speak with a design expert when it comes to invitations, and hire someone who is well-seasoned with color palettes, formatting and fonts, and who has a good eye for details. Use your common sense too – if you’re having a traditional church wedding, maybe bypass the sequins and glitter! 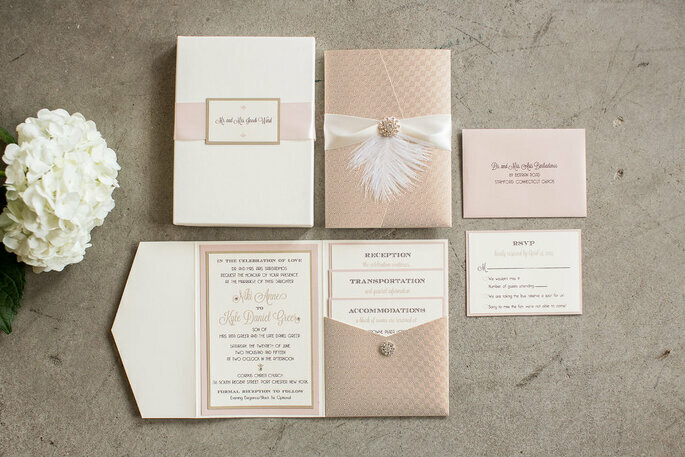 If you’re having a traditional wedding, then whites, creams and pastel palettes are definitely the most appropriate colors to be engaging with in your invitations. Floral motifs are also always welcome, and gold touches in the calligraphy and borders add a glimmer of luxury and finery. 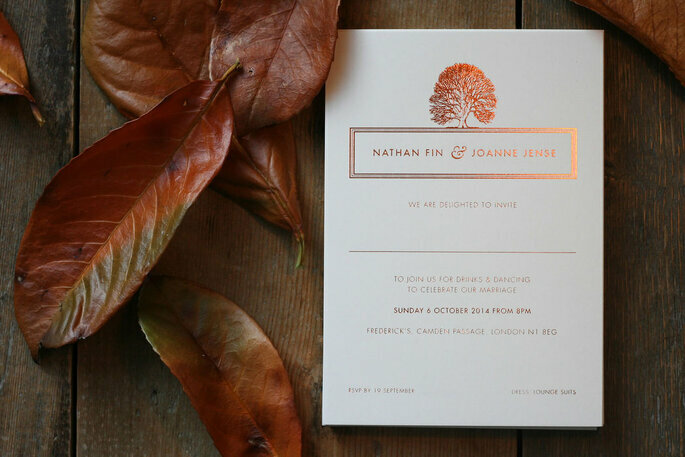 However, if you’re after something a little more modern, then the Foil Invite Company might be the people to ask! 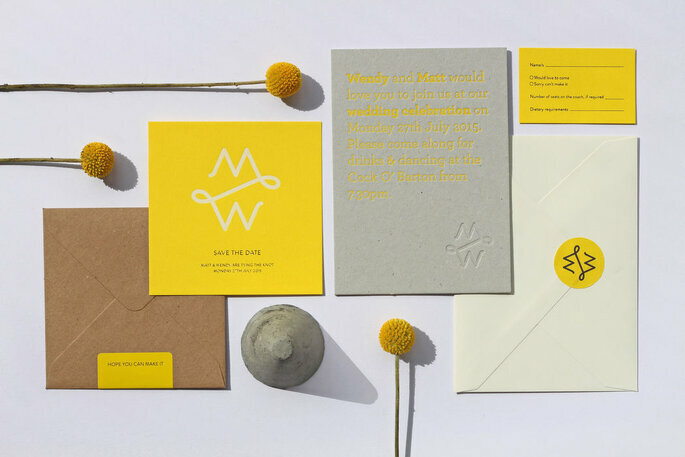 Their bold color combos – such as this yellow/gray number – scream “alternative”, and are a welcome departure from the typical invitations that every romcom in history has shown us. However, take care to not overload your invite with color – we would recommend picking 3 at most, and keeping it simple. Twenty years ago, your wedding invitations were written on cards and posted to your family and friends. Now, you have a hundred different options, though we wouldn’t recommend anything too extravagant that is going to massively detract from your budget. 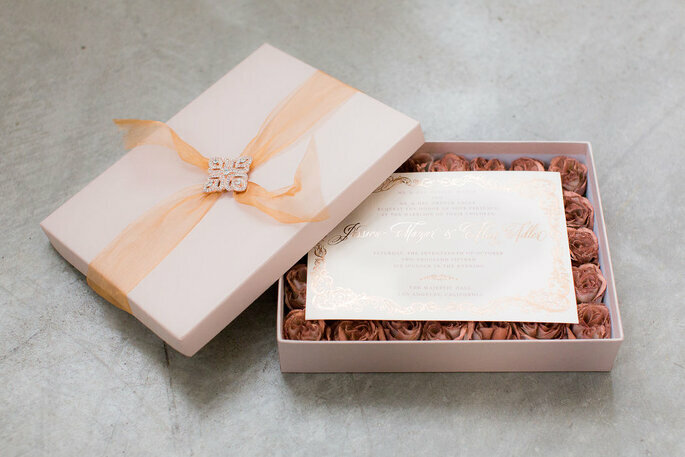 Boxed invitations as pictured below from the marvellous Whimsique designers are a lovely option that will certainly get your guests a little more interested! The classic invite is always sure to be warmly received, but here is an opportunity to experiment a little and show off your personality. Within this realm, also don’t be afraid to explore. Wedding invites do not have to be sourced locally – so branch out a little further, check out boutiques, and search online until you find the style that you want. Your wedding invites are essentially an exercise in marketing and advertising, so take a leaf out of the experts’ book with less is more! Don’t overcrowd your invitations with unnecessary text or images – keep it simple, and make it easy for your guests to ascertain the information that they need. That means a big emphasis on names, the date and time, and the venue/location. If you’re sending menu options alongside your RSVPs, then of course please do specify dietary requirements (we don’t want to be responsible for any allergic reactions! ), but for the main invite, what you need is basic text made beautiful. 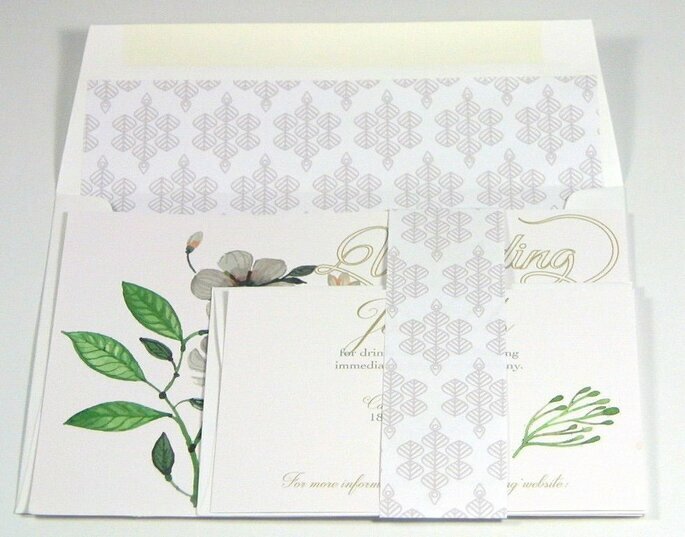 Wedding invitations are about aesthetic as much as the info! It’s good practice and good manners to make sure that your guests receive their wedding invitations with ample time to decide and respond – particularly if you are having a Destination Wedding that requires people to make travel and accommodation arrangements. Between two to three months is usually a good amount of time, although it does depend on the time of year. If you are having a summer wedding (or are travelling abroad), three months is recommended – people tend to travel in July and August, so make sure your invite arrives before they book their holiday! If you are staying closer to home, or having a fall wedding, you can get away with sending your invites 6-8 weeks before the date – but for the sake of organization, we would lean towards the three month deadline. Make sure to follow our advice on making the best wedding invitations possible – and make a good impression for your guests!